As I mentioned yesterday, I created a tutorial in pdf form for the Gathering of Gifts: Accordion Book workshop. 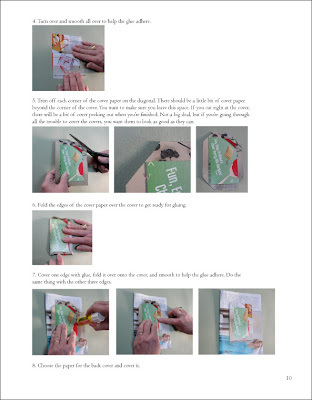 It has 14 pages of step-by-step instructions and two pages of quotes to use in the books you make. I am offering it on lulu.com for $5.00. I particularly like lulu for downloadable digital files because the buyer has an account where the pdf is always stored. Should it get lost on your computer, you can always have access to it online. I am giving away two copies of the tutorial to two randomly selected people who share a favorite quote in their comments. I will compile the quotes in a later post. Please make sure your email address is included so I can contact you if you are chosen. The comments will close at midnight on Friday December 9. 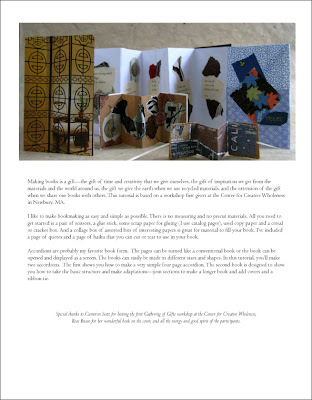 A Gathering of Gifts Accordion Book Tutorial can be purchased at lulu.com. Recently - happily - just found your blog. 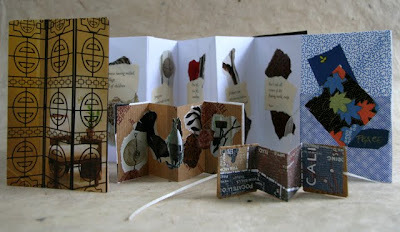 And it would be fabulous to have a copy of your tutorial because I've just begun to learn book making/binding. My favorite because I live it everyday! Love your work and how generous you are in sharing!. I've directed many to your tutorials. A favorite quotation that hangs in my kitchen is from Louisa May Alcott: "she is too fond of books, and it has turned her brain." in some sources it reads "addled her brain." Thanks both for your wonderful blogs and for the giveaway! Your work is a terrific inspiration to me, especially when I teach. Thank you. Author unknown; I found this on an 1800's sampler made by a young girl. Have stitched it up myself several times. I am a daughter, sister, mother, grandmother, children's librarian, papercrafter. I am Hawaiian. Mahalo, thank you for sharing your knowledge and creativity. I chose these two because they seemed most appropriate for what we both do and because I do covet your book. Thanks for your generous spirit and those amazingly, heartbreakingly beautiful Spirit Books. They do inspire me. A lot of my handmade books and cards are made of found paper and other odd scraps in unusual juxtapositions, so this quote is often appropriate! "We need time to dream, time to remember, time to reach for the infinite. Time to be." - Gladys Taber I love her books, not so many people know about her any more. Thanks for the giveaway! “There is no doubt that creativity is the most important human resource of all. Without creativity, there would be no progress, and we would be forever repeating the same patterns.” — Edward de Bono. Because it is the Christmas season, I would like to leave this Bible verse which illustrates the true meaning of Christmas. Thanks again, Susan -- one of my teachers came into the library today looking for some help devising a Yule tree-based accordion book and, using the dreidel book and some inspiration from you, I sent her on her way with a workable prototype in less than fifteen minutes. My prosaic but comforting quote is from Calvin Coolidge -- "Everything yields to diligence."